next post: European-wide unemployment insurance proposals – more bunk! An external surplus is a necessary but not sufficient condition for a nation that wishes to grow during a period of fiscal surpluses and private domestic deleveraging. A fiscal surplus means the government is spending less than it is taking out of the economy via taxations which puts a drag on aggregate demand and constrains the ability of the economy to grow. So the question is what are the relative magnitudes of the external add and the net public spending subtract from income? In Periods 1 to 5, the private domestic sector is saving because the public sector does not negate the overall contribution of the external sector to demand and hence growth. Clearly, the larger is the fiscal deficit the greater is the capacity of the private domestic sector to save overall because the growth in income would be stronger. 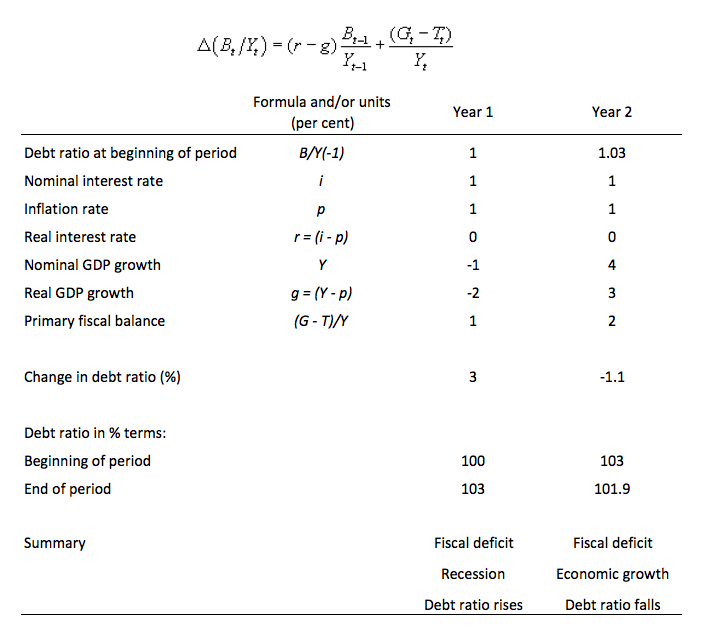 In Periods 4 and 5, the fiscal balance moves from deficit to balance then surplus, yet the private domestic sector can still net save. That is because the fiscal drag coming from the fiscal balance in Period 4 is zero and in Period 5 less than the aggregate demand add derived from the external sector. In Periods 6 and 7, the private domestic sector stops net saving because the fiscal drag coming from the fiscal surplus offsets (Period 6) and then overwhelms (Period 7) the aggregate demand add from the external sector. That is why the external surplus is necessary but not sufficient. It relies on the fiscal surplus being large enough for the private domestic sector to be able to net save. When a nation’s fiscal deficit is declining it tells us that the government has fallen into an austerity mindset. The fiscal balance is the difference between total government revenue and total government outlays. So if total revenue is greater than outlays, the fiscal balance is in surplus and vice versa. It is a simple matter of accounting with no theory involved. However, the fiscal balance is used by all and sundry to indicate the fiscal stance of the government. 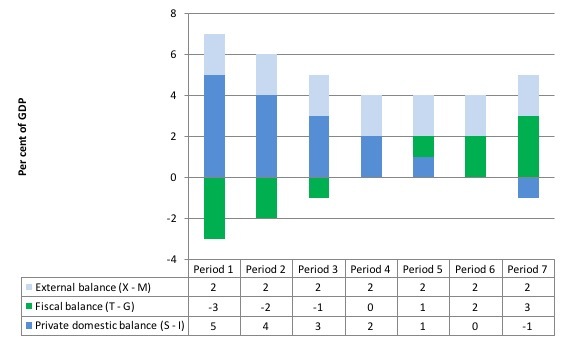 So if the fiscal balance is in surplus it is often concluded that the fiscal impact of government is contractionary (withdrawing net spending) and if the fiscal balance is in deficit we say the fiscal impact expansionary (adding net spending). Further, a rising deficit (falling surplus) is often considered to be reflecting an expansionary policy stance and vice versa. What we know is that a rising deficit may, in fact, indicate a contractionary fiscal stance – which, in turn, creates such income losses that the automatic stabilisers start driving the fiscal balance back towards (or into) deficit. In other words, without any discretionary policy changes, the fiscal balance will vary over the course of the business cycle. When the economy is weak – tax revenue falls and welfare payments rise and so the fiscal balance moves towards deficit (or an increasing deficit). When the economy is stronger – tax revenue rises and welfare payments fall and the fiscal balance becomes increasingly positive. Automatic stabilisers attenuate the amplitude in the business cycle by expanding the fiscal balance in a recession and contracting it in a boom. So a full employment fiscal balance would be balanced if total outlays and total revenue were equal when the economy was operating at total capacity. If the fiscal balance was in surplus at full capacity, then we would conclude that the discretionary structure of the fiscal balance was contractionary and vice versa if the fiscal balance was in deficit at full capacity. The only way a nation can reduce its public debt ratio (short of defaulting) is for the government to start running primary fiscal surpluses (that is, when spending net of interest payments is less than taxation revenue). However, for nations such as Greece, which has ceded its currency sovereignty, the GBC becomes an financial constraints given that it has to fund its spending from taxation and/or bond issues. In other words, a government does not have to run fiscal surpluses to bring its public debt ratio down. What it needs is growth and that is more likely to occur if it holds its nerve and runs deficits. Question one comes up as false on the questionnaire. Actually, is it really always true that a country experiencing a growing labor force or increases in labor productivity necessarily experiences a decline in real GDP if the government is taxing more than it spends while they are running a current account deficit? Even if it happens that the private sector in total is deleveraging (net saving)? Is it not possible that real production could increase even while prices fell a lot and that large fall in prices caused NGDP to fall while real GDP managed to eke out an increase? Might be very unlikely, but is it impossible? Hmmm … Real GDP is the goods/services distributed through the market, valued (for the sake of getting a number) by a standard dollar with inflation divided out of it. If the total of all the money flows through the market have fallen, then the real GDP has to fall. Unless we recognize somehow that there are goods/services distributed outside the market. I’ll just repeat what PhillipO has said. It was very puzzling when the quiz answer “true” for question one was marked wrong. I actually lost some sleep over it! What a relief to know I was right all along and this was a “misprint”! Jerry Brown: An external surplus is necessary, by Identity, irrespective of whether the economy is growing or not. It is not possible to have fiscal surpluses, and private sector deleveraging, without an external surplus. I didn`t have a sleepless night. I decided that I was right whichever way I “interpreted” the question. It was the “necessary but not sufficient” that at first caused me pause..
Totarum @14:49, Yes I got myself confused in the difference between ‘nominal’ and ‘real’ terms. However, question 1 asks about private ‘domestic’ deleveraging. If the private domestic sector owed a large debt to the foreign sector and defaulted on that (declared bankruptcy and refused to pay it or recognize it) perhaps the instantaneous deleveraging of the private domestic sector which occurs as a result would be enough to overcome the government surplus and the current account deficit. Yeah I know this is a really unlikely scenario :). (But it is something Greece maybe should have considered). I like my first answer which goes to the nature of what it means for a nation to ‘grow’ much better. Mel, I believe that with enough deflation it would be theoretically possible for the Nominal values to fall while the ‘real’ values rose. So it would be possible for the total of all money flows to fall while real GDP did not- it is just that the money itself has a higher value and exchanges for more real goods.